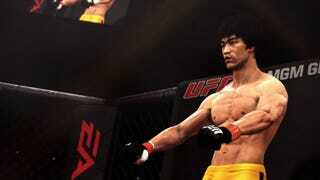 Lee joins the impressive roster of UFC fighters in EA's mixed martial arts game. Bruce Lee can be unlocked in two ways: either by finishing the game's campaign mode on Pro difficulty or higher, or by pre-ordering the game—in which case you can use Lee in your first playthrough. Look for him this Spring, when EA Sports UFC lands on Xbox One and PS4.